It’s been longer than I care to admit since I’ve taken to the mat, so when the opportunity to attend the Om Yoga show popped up I was there faster than you can say ‘savasana’. 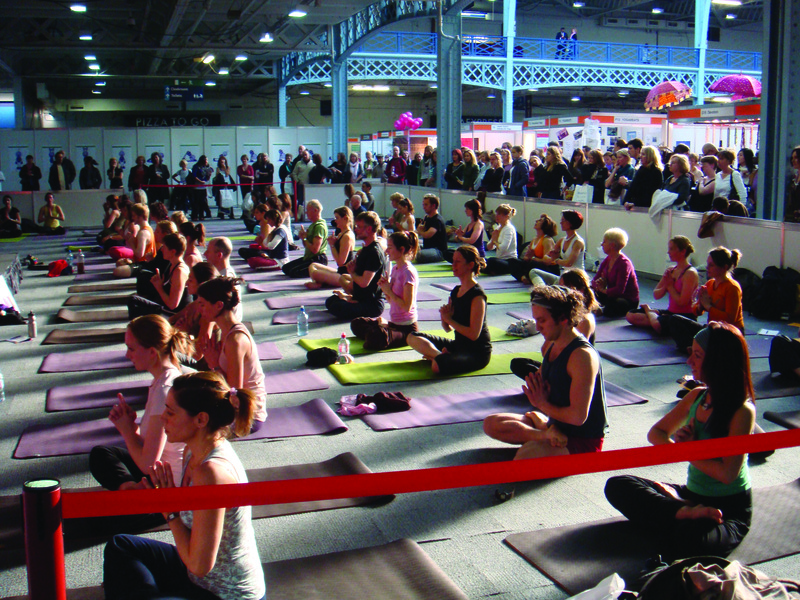 With free open classes over three days, hundreds of exhibitors and lots of great deals to be had, the show attracts thousands of visitors every year – especially as yoga soars in popularity thanks to its current en vogue status. I hadn’t read the programme much beforehand so didn’t know what to expect from the actual yoga. The open classes gave you the chance to try out lots of different styles – from Kundalini, to Face Yoga, to Voga! (Yes, combining yoga with 80s music is a genuine thing. You may remember it from a Made in Chelsea episode not too long ago). My friend and I chose classes with the British Wheel of Yoga, Fierce Grace and Sun Power Yoga. Of these, my favourite was probably Fierce Grace, which usually takes place in a Bikram studio over 90 minutes – guaranteed to leave you sweating! I finished the class feeling like I’d had a full body workout in half an hour and felt so energised for the rest of the day. The teacher Michele Pernetta combined central poses of Ashtanga, Hatha, Bikram and Power Yoga with some seriously deep twists and hip openers which felt just the right level of hard without being intimidating. I thought the Sun Power class would be the most familiar, as Power Yoga is where I’ve had the most experience. However, some of the poses that teacher Ann-Marie Newland led us into were completely new to me, and bloody difficult to boot! The movements were quicker and more challenging than the other classes which meant several wobbly planks on my end. I really liked the use of short, sharp breathwork in this session – it reminded me of Kundalini techniques I’ve tried in Gabby Bernstein’s previous workshops. I found some other cool brands at the show including Satya jewellery, Neal’s Yard Remedies, and Provamel who were giving away free cartons of their delicious nut mylks. We also took advantage of the incredible offer on the Nakd stand and I somehow came away with eighteen Nakd bars. That ought to tell you something about my addiction! Before we knew it hours had passed by and it was time to head home tired, sweaty and happy. It’s definitely encouraged me to get back into a studio pronto – nothing beats that post-yoga high.